This is a tiny 8x8" piece I completed this week -- not sure yet what I'm going to call it. 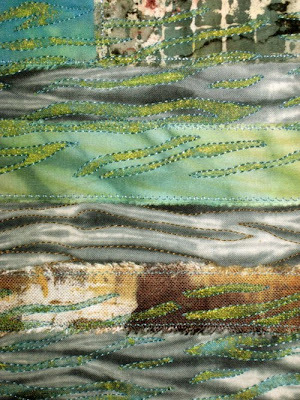 I was going to submit it to Art Quilt Studio, Stampington's new art quilting periodical...but it's a good thing I got in touch with them beforehand regarding a question I had about submissions, because they're ceasing publication after this spring's issue! The theme for the challenge was Closets and what's in them. My little quilt is made of a digital image I took over a year ago of some of my first surface designed fabrics hanging on a bulletin board (actually a row of wine corks glued to a slat of wood, then nailed to the wall). 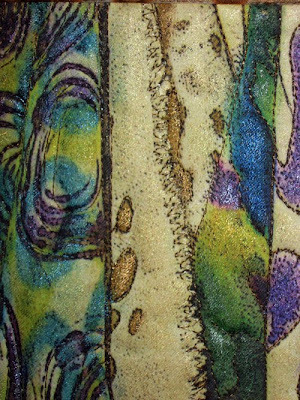 After quilting I added metallic paintstix all over. 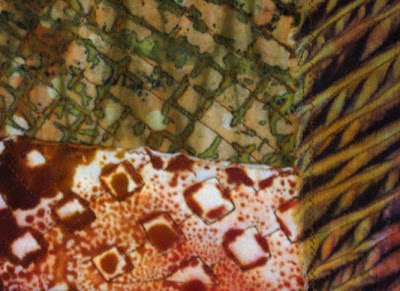 So, there's no chance of my little piece here getting into the aforementioned publication...however, I do have an article coming out in the April/May issue of Quilting Arts about letting surface designed fabrics speak for themselves in art quilts! I am really stoked about this, my first opportunity to be published! If you don't subscribe to Quilting Arts, you'll have to look for the spring issue on the newsstand, probably about mid-March. I'm feeling a lot of dyeing coming on this weekend. 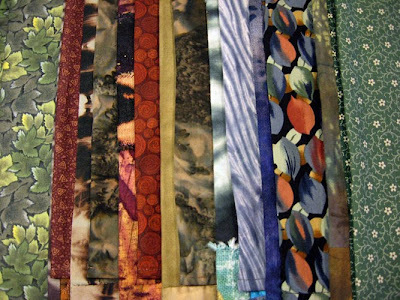 Looking forward to having a bunch of new fabrics to work with! Earlier this week I finally got around to using up some thickened dyes I had in the refrigerator -- from my last deconstructed screen printing session a couple months ago already! 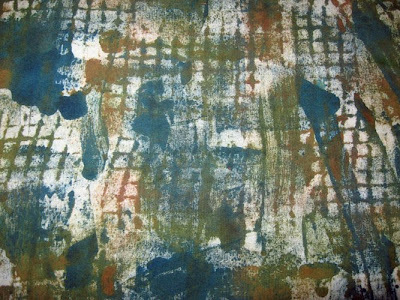 Typically I print on soda soaked fabric rather than having soda ash in the print paste/dye, so the thick dyes last a good while refrigerated. Because I hadn't prepared any fabrics beforehand and because I was going to jettison the leftover dyes after this session, I added soda ash dissolved in warm water to the jars of dye...then I applied them to the fabric. The first piece was monoprinted, and then I used a foam roller to apply dye to the fabric with a heavy mesh underneath the fabric. 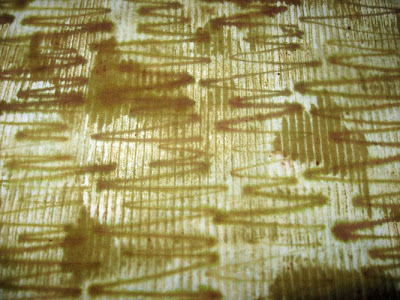 Second piece was direct printed with dye on corrugated cardboard, then I used a syringe to apply the zigzag lines of dye. I sprayed some areas with water, to create softer edges in places. I used a wide foam brush on this piece. The interesting texture of the dye was from alginate that never fully dissolved when I first mixed the stuff up. I sprayed this with water after applying the dye. Monoprinted, then random printed using constructing fencing and another plastic thingy as stencils. 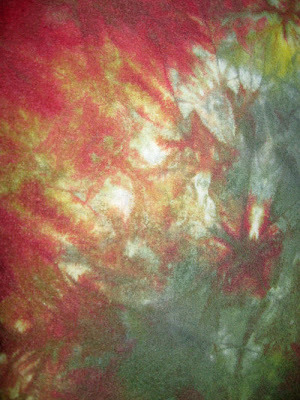 I syringed dye here, then sprayed with water so the dye would bleed. 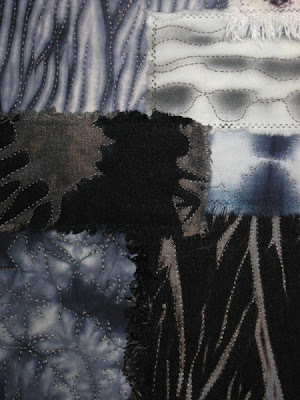 Planning to do more surface design before the end of the month, then on to February's quilt challenges! The piece above, half of an old linen tablecloth, is the best of a bunch of fabric I dyed yesterday by the parfait method -- that is, layering approximate half yards of fabric in a bucket alternately with cups of dye (1 tsp dye powder and about 1 tsp of soda ash per each cup) until you've got about 10 pieces of fabric and 10 cups of dye -- and letting it steep for about 24 hours. This second piece was in that batch as well, and it's a piece of raw silk. I used a variety of fabrics -- raw silk, old linen, silk gauze, silk habotai, silk crepe de chine, brocade silk, silk chiffon, Kona muslin, and a couple other things I can't remember -- and I used a variety of dyes in the warm green, rust and purple families. Thought it would all turn out better than it did, so I'll likely overdye the pieces I don't care for. You never know what you're going to get with this method. This dye technique works best with fabrics that have body -- cottons, linen, the raw silk -- but not as well with the very fine fabrics that don't hold creases and folds. This last image was an interesting experiment I've wanted to try for quite some time. Both pieces were shiboried on a pole and painted with Setacolor transparent paint. 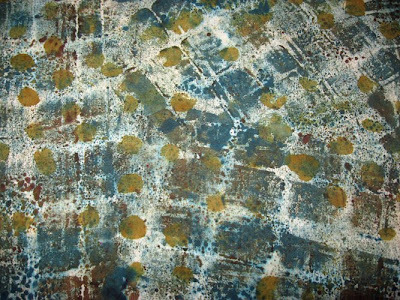 The slightly tan piece at lower left had been fully painted with brown and black paint, wrapped on a pole while wet, scrunched down, and left out in the sun to dry. The outside folds that were exposed to the sun are the dark lines you see. The other sample was wrapped on a pole as an undyed piece of fabric, scrunched, then painted with black Setacolor. The lighter areas were not exposed to sunlight plus didn't have any paint on them...although they turned slightly blue/gray as some paint bled through. I kind of prefer the way the first piece turned out better than the second, but it seems like a waste of a lot of paint when most of it isn't exposed to light and therefore doesn't develop. Anyhow, I'm not sure that I would do this again, but it was on my mind to try and I'm glad I did! I spent most of today photographing jewelry that I have for sale, and I just posted some of it on my sales blog. Hop on over there and have a look. I'll be uploading the rest of it over the next few days, then making a big announcement in time for Valentine's Day. Many of you probably don't know that before I got seriously into fiber and textiles, I was a jewelry designer. 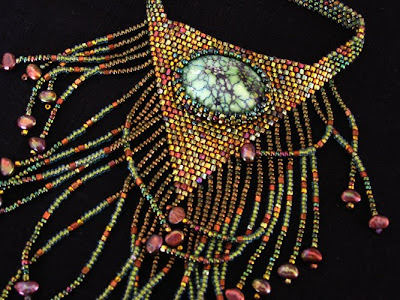 I won't bore you with the details, except to say that I beaded for about 10 years and did shows with my work for 5 or 6 years. I don't bead anymore these days, except for the very occasional piece for myself, a rare custom order, and the more recent beading I've done on art quilts. Hoping to get to using up some refrigerated thickened dyes tomorrow, it just didn't happen today! I'm taking a break from tinkering with photos in Photoshop, to post my latest quilt. 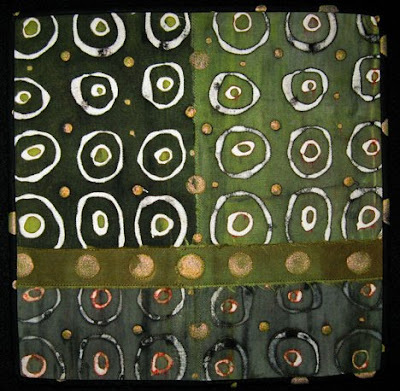 This is the first of my new circles series, called Circles 1 at this point. It's 12x12 inches and I'll be putting it right on a frame. 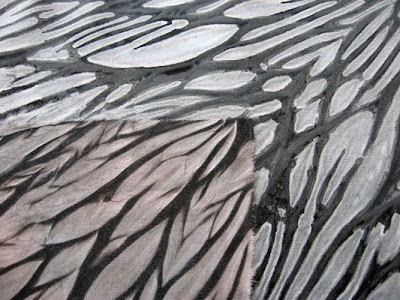 The three main sections of fabric were all from one session printing with a deconstructed screen. Amazing how different the prints can be from the same screen. I made some binding fabric yesterday, by applying random dots of Setacolor Shimmer in varying sizes to a piece of black Kona, then did a French binding this morning. So speaking of circles, and as I'm working with photo images, it seems apropos to mention that it seems as though there's potentially no end to the possibilities inherent in one good digital image. In fact, the endlessness goes way beyond that. 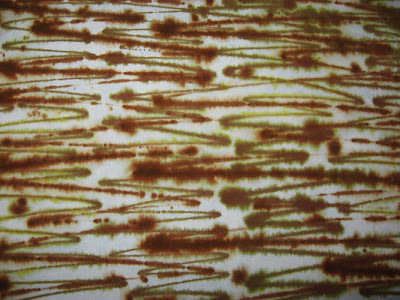 For instance, often, when I prepare deconstructed screens for printing, the screens themselves are so engaging with the dried dye on them in unusual patterns, that I'll photograph them. I've then printed those images on fabric and quilted them. I may go back to the image, remove the color, boost the contrast, and consider it for a potential thermofax screen. So that image will show up on fabric again in the future, transformed yet again from the original. Some of my favorite photographs are images I've taken of fabrics I've surface designed. 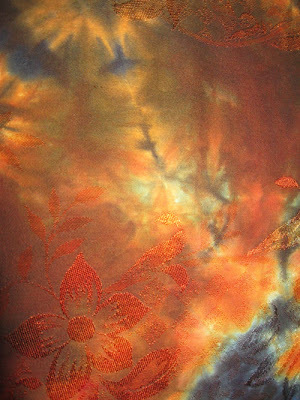 Which I've often then printed on fabric and used in quilts. It reminds me of one of those photos of mirror images repeating endlessly toward the horizon. I make the fabric, I photograph the fabric, I print the image on fabric...ad infinitum. 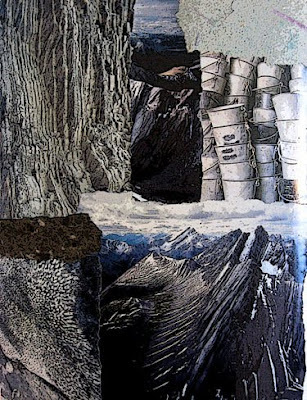 Similarly, I'll tinker with digital images of my paper collages, upload them to Collage Journey, print them on notecards, and use the outtakes as material in my paper collages. 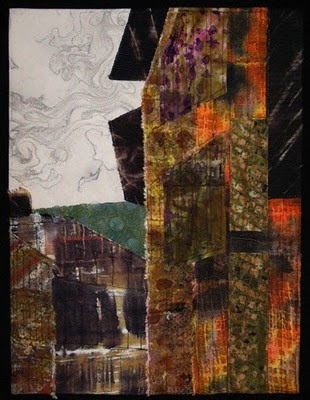 I've also printed collage images on fabric and quilted them. Round and round it goes. So it appears as though everything I'm doing influences everything I'm doing. I suppose another way to conceptualize this is that my creativity has come full circle. Perhaps this is why I am so enamored of circles! I finished my second version of the photo taken in Citta di Castello, IT (mistaken in the first quilt as San Sepolcro) and named it Citta di Castello. Compare with the first quilt, here. I'm actually happier with this second piece because I'm leaning more toward abstract work than pictorial or representational. With this quilt's completion, I have already met my goal and stretch goal for this month, i.e., four 16x12" quilts finished. And it's only the 19th! Oh yeah, and I did Eclipse last weekend, that little discharge quilt that I'm loving seeing on my studio wall. And then, today I quilted my January circles 12x12" piece, the latest challenge I added last week...and I've got something else in mind for the last week of the month. Maybe it's because these pieces are relatively small, or maybe it's just because I'm on a roll...but I am beginning to amass quite a body of work. Thinking ahead to next year, I'd like to hang a show somewhere of the photo to fabric quilts, each pair along with an 8x10 copy of the image that inspired them. 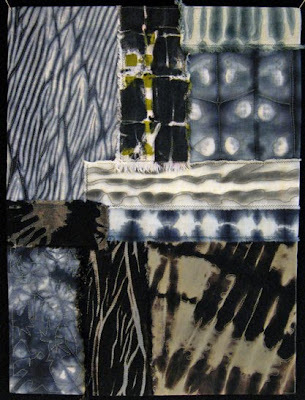 And perhaps a show of the collage quilts and their paper collage inspirations. I'm feeling like I want to work bigger, and I continue to be intrigued by the possibilities of square work. I'm thinking perhaps my next monthly challenge -- if the next quilt spawns another personal challenge -- will be 24x24." Stay tuned! Here's a little quilt I made this week. 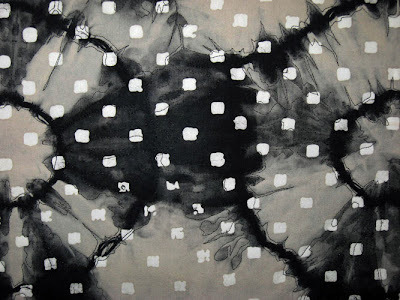 The fabric, black cotton with printed white squares, was one of my very first discharge experiments, over a year ago. 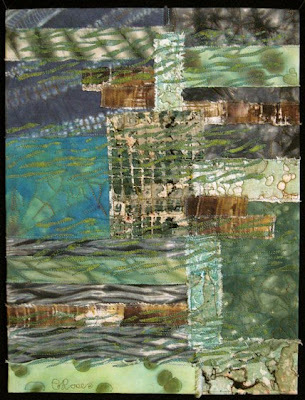 I thought periodically about quilting it, but saw something this week in SAQA's Portfolio 16 that brought this piece of fabric to mind. And right then and there I got it ready to quilt. I'm calling it Eclipse. I did a French binding with black commercial cotton with tiny dots on it. And now the piece is on the wall in the front room of my studio, hung by fabric tabs over a piece of bamboo. 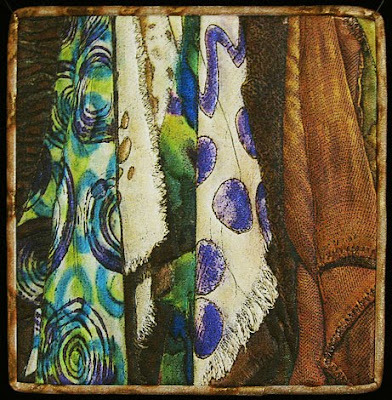 I just posted some fabric postcards to my Textile Sales blog -- check 'em out! Today is "Reveal Day" over at Fiberactions -- we're doing show & tell of our Initiative Challenge quilts, which we've all been working on since early November. Sometime later today we'll get our next challenge word. I can't wait! My piece, called Carpe Diem, was born from mindmapping the word "initiative" and coming up with volition, emergence, energy, fire, force, verve and thrust. From the start, I wanted to somehow represent the plant kingdom, something like a germinating seed pushing up through the soil. I pulled out my plant books and stopped as soon as I got to one I have on cactus plants (creatures), which I love. Cactus plants are amazing beings. They can live for hundreds of years, and thrive against all odds. They can live in the most extreme conditions -- hot AND cold. They can store up energy and resources for years, if they have to, before it rains and conditions are ripe for them to bloom. They are otherworldly, humorous, graceful, stalwarts against predators, havens for desert critters. Everything these plants are capable of doing, and how they do it, speaks volumes to me of "initiative." All the fabrics I used -- except for the flowers and buds -- were direct printed or deconstructed screen printed. If you've been reading recently, I mentioned once or twice that the original background fabric had been moderately rusted fabric that I found impossible to sew. 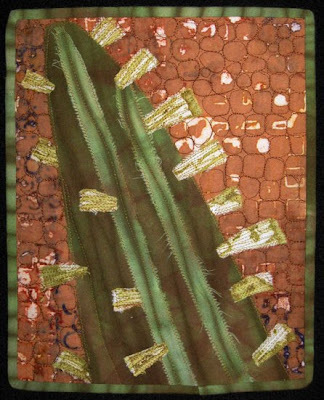 So I cut off all the cactus parts that had been appliqued onto the rusted fabric -- cut them off in one piece -- removed as much of the rusty fabric as I could from behind, and put the whole thing on the new backing fabric. Which turned out to be a much better background. 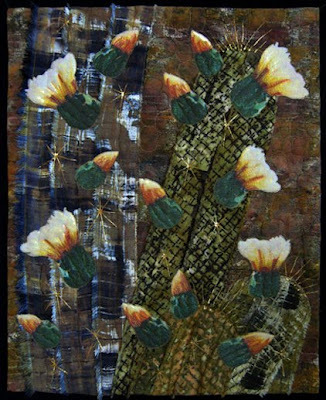 The flowers and buds are digital images of photos from the cactus book, printed on muslin, touched up with metallic Paintstix, appliqued onto the cactus background, then quilted. The spines are textile paint. I had originally tried quilting the spines, on an early version, but they were way too difficult to see, and added far more stitching to the piece than I wanted. This little cactus is an 8x10" study I did about a month before executing the final challenge quilt. 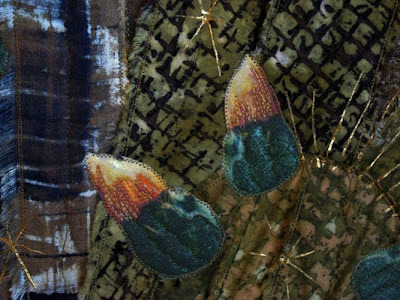 I really love this little piece, everything works -- the fabrics I chose, the way it's quilted, the way I represented buds and spines. But compositionally, the bigger piece needed more. Definitely go to Fiberactions and check out what the other 12 group members came up with. Everyone's take on Initiative is entirely different! There's a Zen saying, "You can't step twice into the same stream," that's so apropos to getting a new hard drive -- things are never quite the same as they were before, even though nothing substantial has changed. How strange it all is. Many of the same programs look different -- like Blogger, for one. As long as everything works the same, I'm fine with it. But it just goes to show that you can't be attached to anything these days! Anywho, back at the ranch...I was going to upload new photos of San Sepolcro after having touched up the entire piece with Paintstix, but I'm on to other things now so I won't go back. Let's just say that with the addition of the metallic oil paint rubbed lightly everywhere, the quilt has much more of that "under the Tuscan sun" look. 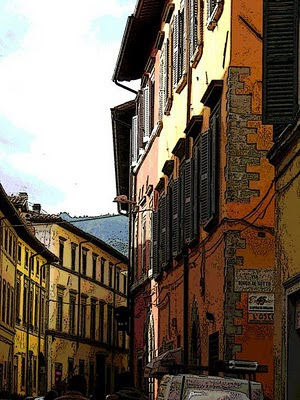 Oh, and an aside -- I think the photo was from Citta di Castello, NOT San Sepolcro! We went to both places that day, and I'm quite sure now that the photo was from the first place we stopped -- where we visited a weaving workshop that's been in existence for over 100 years. Maybe I'll name the second articulation of the photo Citta di Castello! So, about the piece here, it is my second collage quilt for January -- original collage below -- named Up Above It All. I think this one's my favorite! The fabrics are cotton and linen, discharged, shiboried or both, and printed. No, I haven't dropped off the face of the earth! My computer's been in the shop -- the hard drive on my new Lenovo crashed over the weekend. So I haven't spent a lot of time online, haven't uploaded photos anywhere, haven't checked anybody else's blog. But I have been busy in the studio, and I'll start uploading photos here as soon as I can. I hope to be back online officially tomorrow evening. 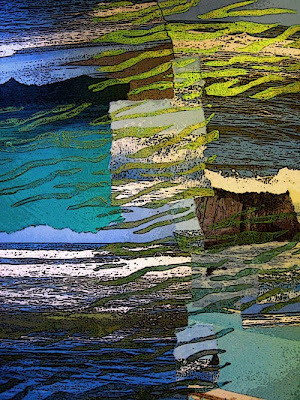 Meanwhile, please check out my Textile Sales blog -- I posted new work there a few days ago and will be posting more things later this week. And thanks for those sales! This is my first "photo to fabric" quilt of 2010, and again I chose a photo from my trip to Italy as inspiration. The 16x12" quilt is called San Sepolcro after the town where the photo was taken. San Sepolcro is in Tuscany, very close to where I stayed in Umbria on my trip, and among other things is the birthplace of the painter Piero della Francesca. Actually, many streets in Italy look like this, so this could be any number of places. I had to refer back to my photos to figure out where it was! The fabrics used here are linen and cotton, the bright orange printed piece was an old linen napkin, the darkest pieces are discharged, and the sky is suminagashi'd muslin. I have no idea, yet, how I'll interpret this photo for the next quilt (to comply with my challenge of two quilts each month from one photo). Maybe I'll just move on to another photo. I can break my own rules, can't I? My usual method of finishing quilts has included sewing a fabric label on the back, as well as a hanging sleeve. However, when I decided a couple months ago that I wanted to put smaller pieces on frames, I stopped adding the sleeve. The first 16x12 piece I completed, I wrapped the fabric right around the frame and stapled it on. But I didn't really like it, it felt like something was missing. I unstapled it all and finished the quilt as usual, handstitching the facing on the back. I realized that I prefer laying a finished quilt on top of a frame, as I did recently with some of my 10x10" quilts, and adhering it. 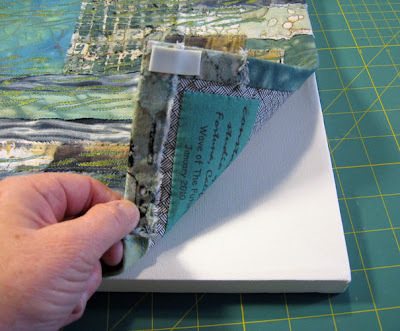 But I haven't wanted to do this with my growing collection of 16x12" quilts -- largely because nearly all quilt shows and fiber art exhibitions require art quilts to have a hanging sleeve. If I frame these pieces permanently, then I can't enter them in shows. Using the quilt I finished yesterday, Wave of The Future, I came up with this solution -- I added a sleeve, and then I adhered the quilt to a frame with that thick, tacky 2-sided tape, around the edges and in the middle. It works just fine, stays on the frame. When I want to show the pieces on frames, I will finish the sides as I did earlier, with acrylic paint or gesso, and I'll use more of the tacky tape. Meanwhile, when I want to enter the quilts in shows, they'll be ready to hang the normal way. I spent nearly the entire day adding sleeves to eight recent quilts. Now they're all finished and ready to show! My first finished piece of the new year, Wave of The Future, 16x12, part of my growing collection of quilts based on paper collages. The actual collage, which I used as inspiration, is not nearly as color-boosted as the digital image of the collage, at bottom. 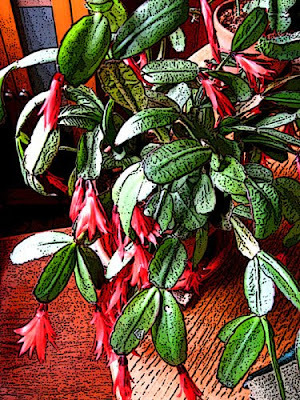 I took the photo early last year and tinkered with it in Photoshop. Always thought it would make good quilt material, and here it is! The fabrics are mostly cottons, with a few pieces of linen, and all low water dyed, shiboried, printed, screened and/or stamped. I have another collage piece ready to quilt, as well as a photo-inspired piece. I'll likely do the latter first, to complete half of my declared monthly personal challenge this year. (The collage quilts, two a month hopefully, are my stretch challenge.) There are lots of other projects in the works, as well, although mostly in my head at this point. It's a beautiful winter morning here on the North Coast, rather mild, little chance of rain today. And after doing some personal business, I'll spend the day in the studio, getting the next jump on this new year! I promised I'd post photos of my latest rusted work, and here they are. The fabric was three yards of heavy silk charmeuse that I was commissioned to rust. The top photo is the satiny side, the crepe side is below. 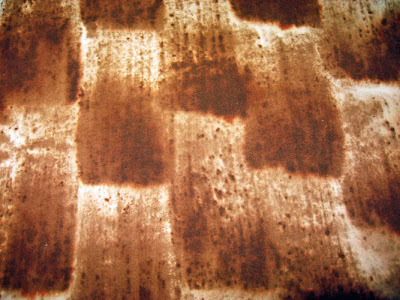 I found this fabric to be challenging to rust, primarily because of its thickness. Overall it took me about 10 days and three go-rounds of rusting and finishing before I got enough rust on the fabric. It's going to be used for garments and I'm hoping I get to see photos of the finished pieces. Recently I began hunting around for info on how to properly finish off rusted fabric, because this piece was not a sample and I wanted to make sure it was as user friendly as possible for the client. 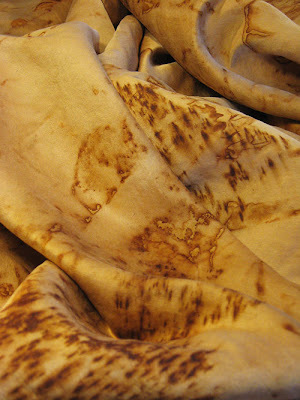 I hadn't realized rusted fabric might present problems when sewing, until I attempted to use some moderately rusted muslin as the background fabric for my Fiberactions "Initiative" quilt (to be revealed on January 15). There was enough rust on the surface of the cotton that I shredded every kind of thread I tried to use and dulled a few needles. For the quilt, I ended up cutting off everything I'd machine appliqued onto the rusted fabric, and putting it on a new background fabric -- which was fortuitous because the quilt turned out much better than it would have on the rusted fabric. 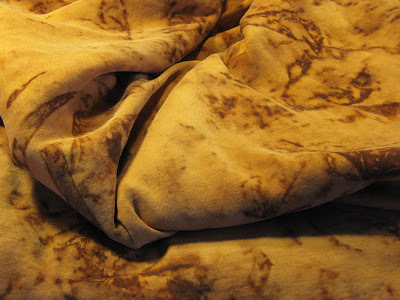 But I did realize that I needed to learn a few things about finishing rusted fabric if I wanted to sew with it. 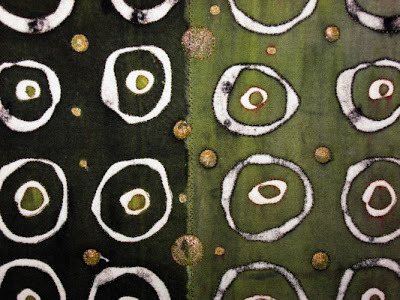 I found quite a bit of information online, including Kimberly Baxter-Packwood's Natural Surfaces Zine, with a lot of advice for treating heavily rusted fabric as well as tips for sewing on it. Combining info from various sources, what I did to finish this silk was to soak the fabric for a half hour in a half-sinkful of warm water with 1/4 cup salt and 1/4 cup baking soda. The salt stopped the rusting process and the baking soda removed much of the tiny bits of metal on the surface of the fabric. Then I washed the fabric in hot water with about 1/4 cup synthrapol and another 1/3 cup baking soda. The final soda was added to the wash to remove the rust and vinegar smells from the fabric. The fabric turned out beautifully, and I'm hoping it's a pleasure to work with! By random number generation I have drawn winners in my two Giveaways. The winner of the framed quilt Off The Wall, is Anna, lucky number 7 of the 31 folks who commented on this blog. 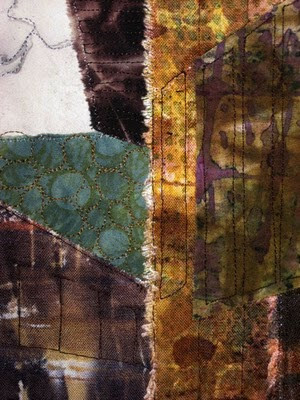 The winner of an 8-pack of collage notecards is Emma, lucky number 12 of the 12 folks who commented on Collage Journey. Both of you please email me your mailing address and your gifts will be in the mail early next week. Wishing everyone a wonderful, quiet New Year's Day, a great weekend, and a terrific 2010!